This scene is located a little ways north of Silverton, CO. There was an artist, Jack Stern who has lived there for many years in a one room cabin with his wife and 2 boys. They usually get snowed in for a few weeks every winter. He told me at the time that this is where Jon Claude Killy set a down hill ski record back in the day. I wonder if he was wearing his cowboy hat? Jack had a tenancy to tell a "story" once in awhile to had a little spice to life. It took a little four wheel driving and a short hike to get up here. It was one the the few places that I had been late in the summer that still had a good amount of glacier left. 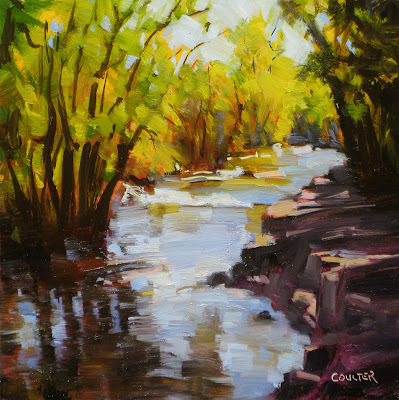 This is Boulder Creek in Boulder Colorado. It runs through the town along with a path where you will usually find couples, people walking their dogs, or riding a bike. I lived in Boulder for a short time and it is a very "Green" city. The city would purchase individual farm type property and make hiking trails through it for the public. I thought I'd go up north a little ways to where it was cooler to paint. 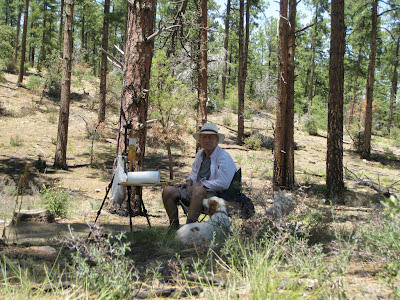 The dogs and I arrived at Groom Creek, only about an hour drive up in the forest right outside of Prescott, AZ. Jack took off running at full speed through the cool forest. We hike as far as I could go, it was at least a few miles...then sat down, set up and just looked around from that spot for something to paint. I wasn't moving another foot. I just picked out this tree pattern on a hill with some sky behind. 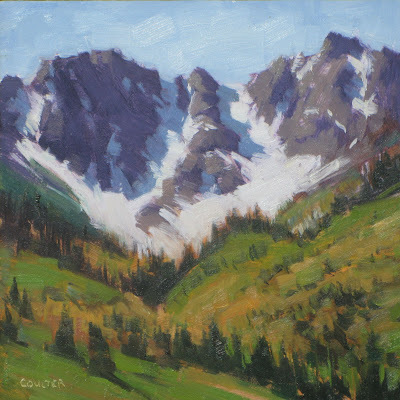 It was not something I normally paint, nor did I followed my regular scene decision process, but I loved it. The air was clean and cool with a pine scent and it was a challenge. 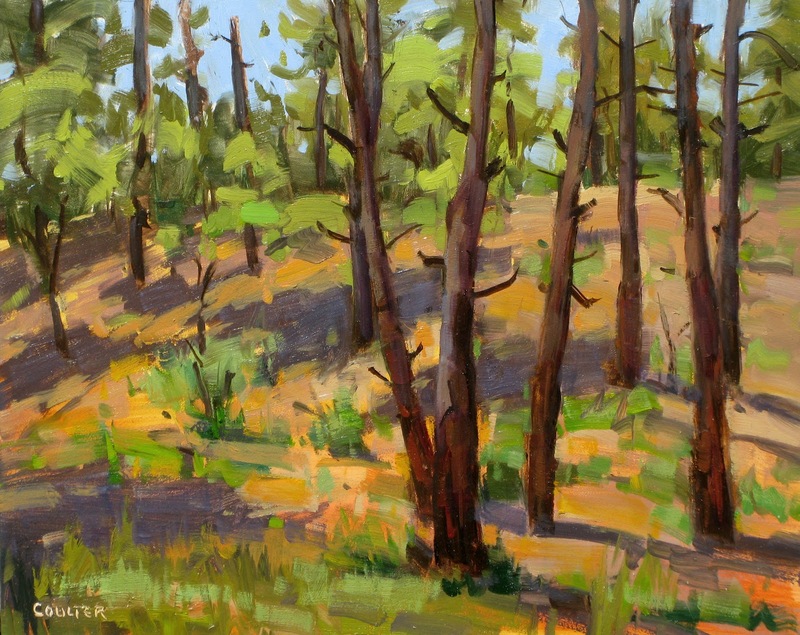 To me, painting outdoors is very different than painting in the studio from photos. 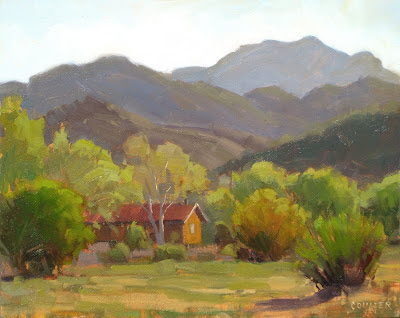 I think many times I prefer a bad painting done plein air than a masterpiece done in the studio. The outdoor piece touches me at a deeper level. The studio piece is more technical, detailed, and thought out, but the field study is more poetic. Painting from "life" with an added time element forces the painting to be fresher and more spontaneous with better color. I also like the challenge of painting outdoors. The simplification decisions that must be made as the light rapidly changes the whole scene. 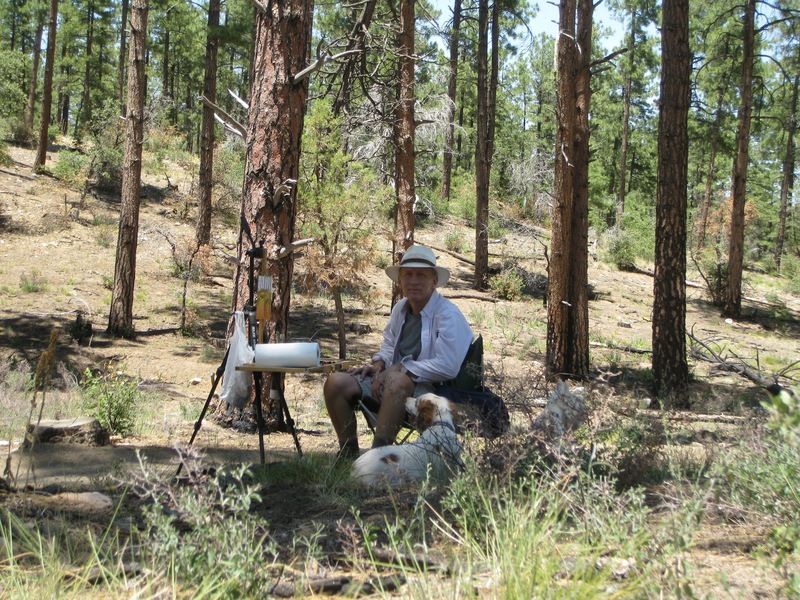 I am right there as time is passing during my painting process, I'm interacting with nature. The information available from Nature gives me a million times more options than a photo reference. This spot is not too far from where a good friend of mine used to have a cabin. The dogs and I would often come up and hike here. There's a small lake nearby, that I often have trouble finding. That's whey we hiked so far, before collapsing on the forest path. Notice we found a nice shady spot. I finally had to bite the bullet and go out in the 3 digit heat and do some painting. It was a little cooler closer to sundown, but I still put up my umbrella to give me some shade. The dogs went over behind a bush and looked at me like I was crazy.